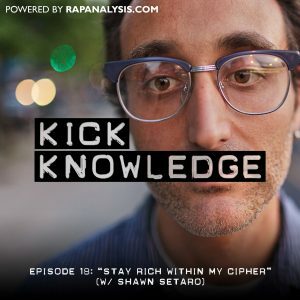 In this episode, Zach and Steven are joined by the creator and host of the critically acclaimed hip-hop podcast called The Cipher: Shawn Setaro. The Cipher is renowned for its in-depth interviews with some of the most important people in hip-hop music and culture. Throughout the episode Shawn talks about how he got into hip-hop, how the Cipher got started, and the importance of a hip-hop podcast and communicating with significant figures in the culture.